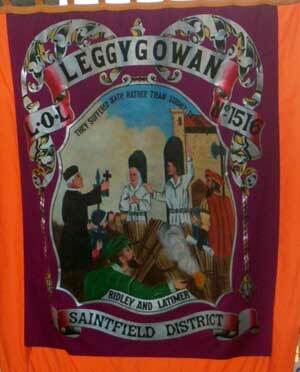 Many Orange banners feature a portrait of the martyrdom of Hugh Latimer and Nicholas Ridley, who were burnt together in the reign of ‘Bloody’ Mary at Oxford on 16 October 1555. In this article we look at the life of Nicholas Ridley. Nicholas Ridley was born in 1503 in Willymotiswick, in Northumberland, near to the Scottish border. His early education was received at a school in Newcastle-upon-Tyne, and in 1518 he began his studies at Pembroke College, Cambridge. He proved to be an excellent student and became a Fellow of Pembroke in 1524, Chaplain to the University in 1532, Senior Proctor in 1533 and Master of Pembroke in 1540. Ridley’s grasp of the Protestant Faith was gradual. He signed the decree against the Pope’s supremacy in 1534. 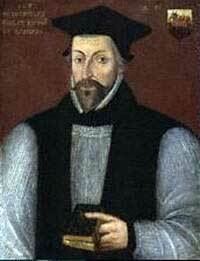 In 1537 he became Chaplain to Archbishop Cranmer, and was appointed by him to be Vicar of Herne in East Kent in 1538. As a result of studying the writings of the Church Fathers he began to have grave doubts about the Roman Catholic teaching regarding the Lord’s Supper. He shared these doubts with Cranmer, but it was not until 1545 that Ridley had completely renounced the Roman Catholic teaching of transubstantiation. As Bishop of London, Ridley issued an instruction that communion tables should replace altars in the diocese: ‘wishing a godly unity to be observed in all our diocese, and for that the form of a table may more move and turn the simple from the old superstitious opinions of the Popish Mass and to the right use of the Lord’s Supper, we exhort the curates, churchwardens, and questmen here present, to erect and set up the Lord’s board after the form of an honest table decently covered ... and to take down and abolish all other by-altars or tables’. In 1540 Ridley became Chaplain to Henry VIII and he received rapid promotions. 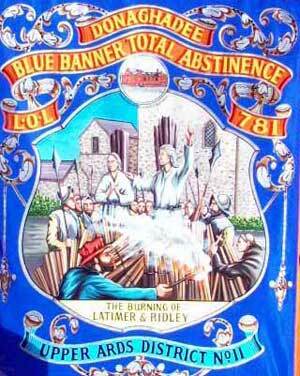 In 1541 he was made Prebendary of Canterbury, and in 1545 a Prebendary of Westminster. In 1547 he became Vicar of Soham, and he was also nominated as Bishop of Rochester. In 1550 he was appointed as the Bishop of London by King Edward VI and in 1553 he was nominated as Bishop of Durham. When he became a Bishop, Ridley worked alongside Archbishop Cranmer in establishing and consolidating the Reformation of the Church of England. He was one of the most learned of the English Reformers and was one of the main architects of the Thirty Nine Articles of the Church of England and the Book of Common Prayer. Ridley also exerted a good influence on King Edward VI encouraging him to establish sixteen grammar schools as well as a number of hospitals. John Foxe describes Ridley as ‘sober, discreet and wise’ and wrote that his preaching was ‘the true and wholesome doctrine of Christ’. Due to the death of King Edward VI he did not take up the post of Bishop of Durham. When Queen Mary came to the throne he was excluded by name from an amnesty, and was imprisoned in the Tower of London. From the Tower of London, Ridley was sent to Oxford in 1554, where after two years imprisonment he was burned along with Hugh Latimer on 16 October 1555. In a letter to the prisoners in Christ’s cause, Ridley wrote: ‘Why should we Christians fear death? Can death deprive us of Christ, which is all our comfort, our joy, and our life? Nay, forsooth. But contrary, death shall deliver us from this mortal body, which loadeth and beareth down the spirit, that it cannot so well perceive heavenly things, in the which so long as we dwell, we are absent from God ... Let us not then fear death, which can do us no harm, otherwise than for a moment to make the flesh to smart; for that our faith, which is surely fastened and fixed unto the Word of God, telleth us that we shall be anon after death in peace, in the hands of God, in joy, in solace, and that from death we shall go straight unto life ... let us comfort our hearts in all troubles, and in death, with the Word of God: for heaven and earth shall perish, but the Word of the Lord endureth for ever’. On the day of his martyrdom, Ridley was brought to the place of execution at the end of Broad Street, near to Balliol College. When Ridley saw Latimer arrive, he ran to him and greeted him, saying ‘Be of good heart, brother; for God will either assuage the fury of the flames, or else strengthen us to abide it’. They then prayed together and talked with each other. They were forced to listen to a sermon and then told to prepare for their death. Ridley’s final words before the fire was lit were ‘Heavenly Father, I give Thee most hearty thanks that Thou hast called me to a profession of Thee even until death. I beseech Thee, Lord God, have mercy on this realm of England, and deliver the same from all her enemies’. Latimer then gave his famous words of encouragement: ‘Be of good comfort, Master Ridley, and play the man; we shall this day, by God’s grace, light such a candle in England as I trust shall never be put out’. In the flames Ridley cried out with a loud voice in Latin, ‘Into thy hands, O Lord, I commend my spirit: Lord receive my spirit’ and afterwards repeated this in English. 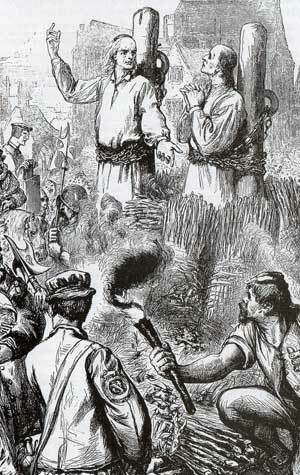 Latimer died quickly in the fire. However Ridley took a long time to die, as the fire took a long time to burn up and burnt mostly around his legs, eventually the flames reached a bag of gunpowder, which Ridley’s friends had put round his neck, and he died. Bishop J C Ryle, wrote in the Nineteenth Century: ‘Nicholas Ridley, Bishop and martyr, is a man whose name ought to be a household word among all true-hearted English Churchmen. In the noble army of English Reformers, no one deserves a higher place than Ridley. Together with Cranmer, Latimer and Hooper, he occupies the first rank among the worthies of our blessed Reformation, and in point of real merit is second to none’.